Whilst promoting his upcoming film "The Girl With The Dragon Tattoo" in New York City last week, Daniel Craig spoke to a group of reporters about the new look for 007 he has been working on with fashion designer Tom Ford for the upcoming 23rd James Bond film. Tom Ford first started working with Craig on Bond's clothes for "Quantum of Solace" alongside costume designer Louise Frogley. For Bond 23, it is understood that "Harry Potter" alumni Jany Temime will be taking Frogley's position. 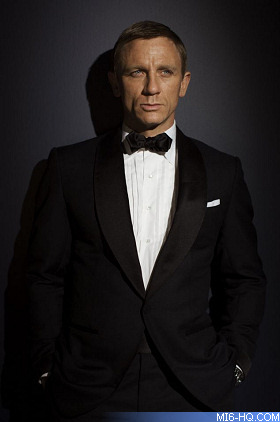 Opposite: Daniel Craig in a tuxedo by Tom Ford for "Quantum of Solace"
Craig was asked whether he still enjoyed taking home some of the costumes from his productions. "I probably was when I first did Bond and I was given all these amazing suits and suddenly I've got this huge wardrobe and I'm thinking 'Oh my God, what am I going to wear?'" "I've kind of flipped the other way and if I could just wear jeans and T-shirts all the time I would. But that doesn't mean I don't like getting dressed up. I'm really lucky to have a wardrobe with five or six beautiful suits done by Tom and some other people. So when the time is right, I put them on, and they're beautiful.